This All Pond Solutions WM-2000 Dual Wave maker / Powerhead has a 360 degree rotation allowing you to adjust the direction of the water current, simulating the conditions of the ocean. Wave makers also help eliminate "dead spots" in your aquarium. Dual head wave maker with 12000 litres per hour max output. Item is otherwise complete with all accessories as you would expect from a new item. Simulates the Ocean conditions your marine fish require. Air pump output: 3 litre per minute. 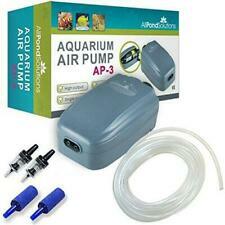 1 x All Pond Solutions AP-3 Aquarium Tropical Air Pump, 180 L/H Flow Rate. Long life and low-frequency operation for continuous use. Air pump output: 3 L/Min. Flow Rate: 180 L/Hour air pump. Long life and low-frequency operation for continuous use. Air pump output: 3 Litre/ Min. Flow Rate: 180 Litre/ Hour our air pump. Air pump output: 3 Litre per minute. 1 x All Pond Solutions AP-3 Aquarium Tropical Air Pump, 180 L/H Flow Rate. Air pump output: 3 litre per minute. Long life and low-frequency operation for continuous use. Air pump output: 3 L/Min. Flow Rate: 180 L/Hour air pump. Locate unit above water level to prevent water flowing backwards. Long life and low-frequency operation for continuous use. Air pump output: 3 Litre/ Min. Flow Rate: 180 Litre/ Hour our air pump. 1 x All Pond Solutions AP-3 Aquarium Tropical Air Pump, 180 L/H Flow Rate. Air pump output: 3 litre per minute. Long life and low-frequency operation for continuous use. Air pump output: 3 L/Min. Flow Rate: 180 L/Hour air pump.1 x All Pond Solutions AP-3 Aquarium Tropical Air Pump, 180 L/H Flow Rate. With its slim, compact design, the pump can be easily hidden from view, giving your aquarium an overall more streamlined look. Available in black colour. Can also be conveniently attached to the glass of the aquarium. Long life and low-frequency operation for continuous use. Air pump output: L/Min. Flow Rate: 0 L/Hour air pump. Locate unit above water level to prevent water flowing backwards. Air pump output: per minute.